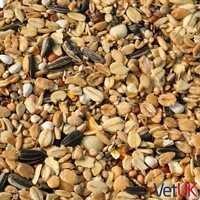 VetUK No Added Wheat Wild Bird Food is a special blend of wild bird food that hasn't had any wheat added. Wheat is known to attract pigeons and doves. By using a No Added Wheat food, you are more likely to attract a wider variety of smaller birds to your garden. VetUK No Added Wheat can be fed from the ground, table or a suitable feeder. Clean fresh water should always be provided. Kibbled Maize, White Millet, Red Millet, Sunflower Hearts, Pinhead Oatmeal, Canary Seed, Black Sunflower, Striped Sunflower, Whole Naked Oats, Red Dari, Peanut Granules, Safflower, Soya Oil.